In a small bowl, combine the lime juice, chile powder, and mayonnaise, and stir until blended. Toast the bread in a dry skillet over medium heat until lightly browned and crispy. 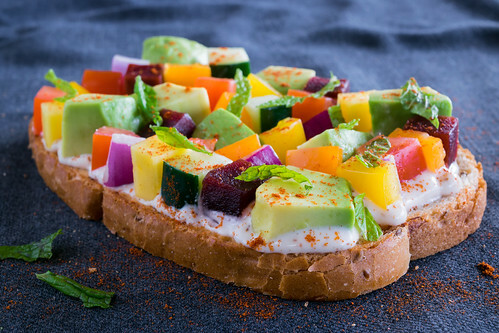 Spread the chile-lime aioli over the toast, then top with the diced fruits and vegetables. Scatter the mint leaves over them, then sprinkle the smoked paprika on top. Enjoy! — To get the mosaic effect, try to cut all the fruits and vegetables to be the same size, about half-inch cubes.